The dsp.StateLevels object estimates the state levels of a bilevel rectangular waveform. Create the dsp.StateLevels object and set its properties. sl = dsp.StateLevels creates a state-level estimation System object™, sl, that estimates state levels in a bilevel rectangular waveform using the histogram method with 100 bins. sl = dsp.StateLevels(Name,Value) returns a StateLevels System object, sl, with each specified property set to the specified value. Minimum and maximum levels of the histogram. Specify the range of the histogram as a two-element real-valued row vector. Signal values outside the range defined by this property are ignored. This property applies when you set the Method property to 'Histogram mode' or 'Histogram mean', and either RunningStateLevels is true, or the HistogramBoundsSource property is set to 'Property'. Source of histogram bounds. Specify how to determine the histogram bounds as one of 'Auto' or 'Property'. When you set this property to 'Auto', the histogram bounds are determined by the minimum and maximum input values. When you set this property to 'Property', the histogram bounds are determined by the value of the HistogramBounds property. This property applies when you set the Method property to 'Histogram mode' or 'Histogram mean', and the RunningStateLevels property is false. Number of bins in the histogram. Specify the number of bins in the histogram. This property applies when you set the Method property to 'Histogram mode' or 'Histogram mean'. Enable histogram output. Set this property to true to output the histogram used in the computation of the state levels. Algorithm used to compute state levels. Specify the method used to compute state levels as one of 'Histogram mean', 'Histogram mode', or 'Peak to peak'. Calculation over successive calls to the algorithm. Set this property to true to enable computation of the state levels over successive calls to the algorithm. Otherwise, the object computes the state levels of only the current input. When you set the RunningStateLevels property to false and you are using a histogram to compute your state levels, you must set the HistogramBoundsSource property to 'Property'. levels = sl(x) returns a two-element row vector, levels, containing the estimated state levels for the input, x. [levels,histogram] = sl(x) returns a double-precision column vector, histogram, containing the histogram of the sample values in x. You can obtain this output only when you set the Method property to either 'Histogram mean' or 'Histogram mode', and you set the HistogramOutputPort property to true. Input data, specified as a real-valued column vector. State levels, returned as a two-element row vector. Compute and plot the state levels of a 2.3 V underdamped noisy clock. Load the clock data in the variable, x, and the sampling instants in the variable t.
Plot the clock data along with the estimated state levels and histograms. A state is a particular level, which can be associated with an upper and lower state boundary. States are ordered from the most negative to the most positive. In a bilevel waveform, the most negative state is the low state. The most positive state is the high state. where S1 is the low-state level and S2 is the high-state level. Replace the first term in the equation with S2 to obtain the α% tolerance region for the high state. 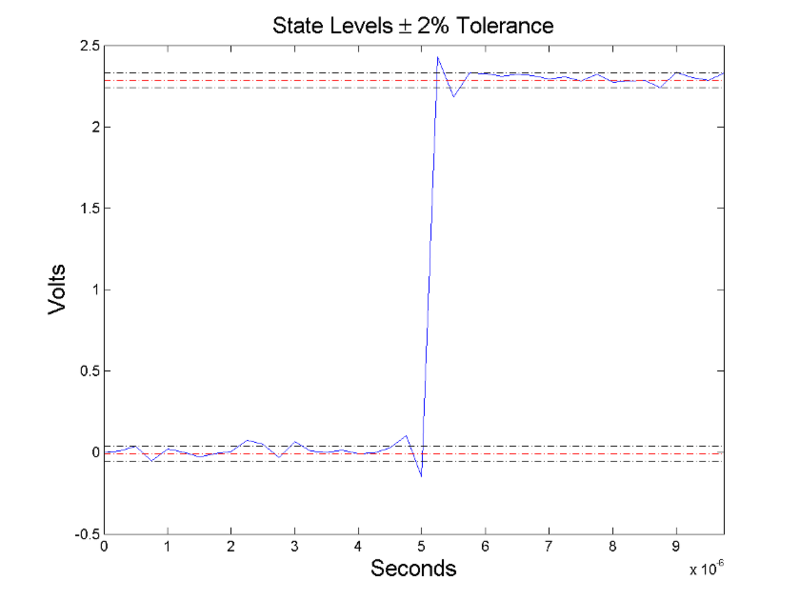 This figure shows the lower and upper 2% state boundaries (tolerance regions) for a positive-polarity bilevel waveform. The estimated state levels are indicated by a dashed red line. Determine the maximum and minimum amplitudes and amplitude range of the data. For the specified number of histogram bins, determine the bin width as the ratio of the amplitude range to the number of bins. Sort the data values into the histogram bins. Identify the lowest-indexed histogram bin, ilow, and highest-indexed histogram bin, ihigh, with nonzero counts. Divide the histogram into two subhistograms. The lower-histogram bins are ilow ≤ i ≤ 1/2(ihigh — ilow). The upper-histogram bins are ilow + 1/2(ihigh – ilow) ≤ i ≤ ihigh. Compute the state levels by determining the mode or mean of the lower and upper histograms.